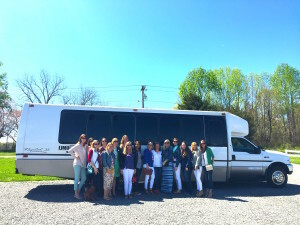 Saturday, 4/2/16, Johnny B’s Limousine had the pleasure to take these lovely ladies on a Yadkin Valley Wine Tour. 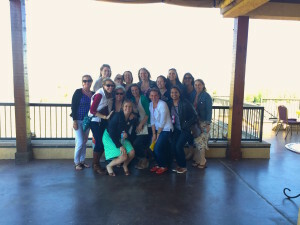 With a group of this size- 17- it took us 7.5 hours to visit 3 wineries and have lunch. 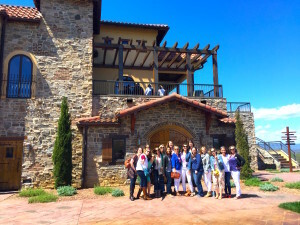 The ladies were also able to have a glass of wine and relax in the sunshine for a bit at the last stop! Joy was a very gracious hostess! This vineyard is a perfect place to have lunch (indoor and outdoor facilities) and a glass of wine! We always enjoy coming here! Great photo ops here at Shadow Springs! They are a popular wedding destination and also host Murder Mystery Dinners as well! At our second stop- Laurel Gray! Benny Meyers (owner of Laurel Gray) taking care of our ladies! He and Johnnie were very informative and entertaining- and their wines are delicious! This is the oldest winery in the Swan Creek Appellation. Johnny B’s Limo Wine Tour Bus outside Laurel Gray Vineyards. Laurel Gray also has a second winery on site called Fruit Crate Wines. Very tasty! Raffaldini is an Italian style winery offering wines made from Italian grapes. It is a popular wedding location with fantastic views of the Blue Ridge and Brushy Mountain ranges. Photo op of Laurie and her friends on the second story of Raffaldini. Even though it was a blustery day, they had a great experience! An upstairs tasting at Raffladini- our hostess was wonderful and very informative. 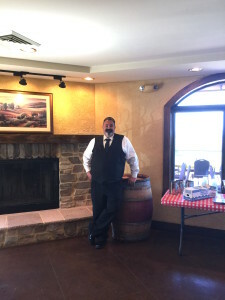 Chauffeur Frank will happily help your group with your wine tour! He will make sure your tasting is set up, take photos for you, and help organize and carry all of your purchases! 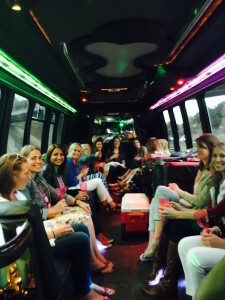 If you would like Johnny B’s Limo Wine Tour to help plan your adventure, give Lenora a call at 704-649-3068. We are not just an A-to-B limo company. We will assist you and guide your choices in order to ensure the best wine tour experience. Too often the hostess/host is stressed out by all of the details involved for the day. Please let us take care of all that for you. Thank-you, and happy wine tastings! The Yadkin Valley Wine Company, home of FRUIT CRATE WINE is owned and operated by Ben E. and Kim S. Myers. 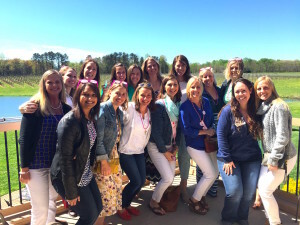 The winery is located at 6324 Laurel Gray Lane, within two premier wine growing regions of North Carolina: Yadkin Valley AVA and Swan Creek AVA. 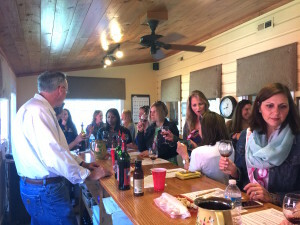 The Yadkin Valley Wine Company is a beautiful 10,000 case production facility with state of the art wine making equipment, including 35 stainless steel tanks and an in-house bottling line complete with labeler. 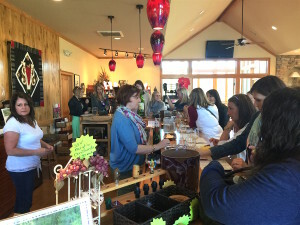 Yadkin Valley Wine Company is a turnkey operation taking the grape from harvest through bottling and labeling for retail sale. Located on the property of Laurel Gray Vineyards, the Yadkin Valley Wine Company structure reflects the circa 1930 barns and tasting room that were already in existence when the new production facility was built in 2007. 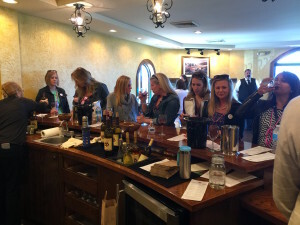 FRUIT CRATE WINES tasting bar is located in the production area of the winery, allowing for a different wine tasting experience. While enjoying a sample of one of our grape and fruit fusion wines you can have a behind –the-scenes view into the daily operations of what it takes to make award winning wine. At the Yadkin Valley Wine Company, quality is always the driving force behind all aspects of the winemaking process. Raffaldini: Villa Raffaldini is a 6,000 square foot tasting room and event venue inspired by villas in Mantua, Italy; home to the Raffaldini family, in the north-central region of Lombardy. Villa Raffaldini features traditional Italian art, architecture, and tasting rooms on both of the two levels. Enjoy panoramic views of the Blue Ridge and Brushy Mountains from inside the tasting rooms and outside on the balconies and landscaped terraces.